Lee, Clarissa Ai Ling. “Review of Making Medical Knowledge by Miriam Solomon.” Social Epistemology Review and Reply Collective 6, no. 1 (2017): 1-8. 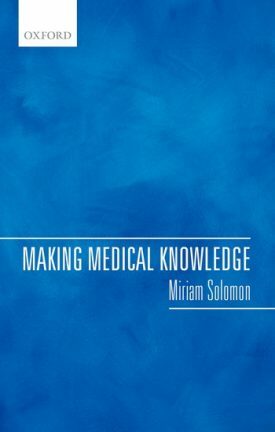 Miriam Solomon’s Making Medical Knowledge is an important contribution to the oeuvre of philosophy of practice in medicine for interrogating medical practices while highlighting many of the ethical and scientific gray areas in the social-epistemological character of medical intervention. The findings of basic science are resituated into a messy chain of causal mechanisms represented by various phases of clinical trials. The production of evidence could be parlayed into the negotiation of guidelines for governing medical situations where consensus over intervention is lacking, and also for the development of a personalized approach in favor of the ‘cookbook’ approach in medical treatments. She highlights some contradictions and miscomprehensions regarding the interpretation of quantitative and qualitative medical evidence, while arguing for need to make a clear distinction between the practice of basic science and medicine. Solomon keeps her philosophical intervention closely situated to the not-always-predictable and non-linear movements of medical discoveries, and their potential for heralding new treatments, as they go from the lab to clinical trials to the stage of treatment interventions; her critical descriptions continuously remind of the importance of not overemphasizing theoretical rigor at the expense of practical applications, while reminding us of the need to encourage strong science for successful interventions to happen. She refuses to play to the dichotomy of art and science in medicine, not because she rejects medicine as bearing both characteristics, but because she chooses to operate from a perspective that both are equally crucial but not the limits by which medicine operates. She also seems to subscribe to the opinion that a reduction of medical knowledge to a dualist representation is merely a submission to a traditional logical-positivist empiricist philosophy of science, and to eschew such dualism is to transcend the binary of “soft” versus “hard”, “precise” versus “mess”, and “reductionistic” versus “holistic”. Beyond claiming that she intends to go beyond the art and science divide in her analysis of medical epistemology, which is also part of her mission to “disrespect” disciplinary boundaries, she declares in the first chapter that she will be providing a pluralistic account of methodologies that bring together the “naturalistic, normative, applied, pluralist, social epistemology” in an integrated manner, especially through a selection of case studies such as that involving cystic fibrosis, treatment of heart diseases, and use of mammography for women between ages 40 and 49 as part of early screening for breast cancer that she uses to highlight a methodologically plural approach in the penultimate (ninth) chapter of the book that considers the integration of the methodologies discussed throughout the book. She is upfront about the STS and HPS traditions that inform her work, even though as a philosopher and lacking formal training in social scientific methods, she acknowledges where her alliance is with philosophy, and to a lesser degree, history of medicine. That said, the methodologies discussed in the book are the consensus conferences for group deliberation among a group of experts (although non-expert stakeholders are also sometimes involved); evidence-based medicine (which some equate with “cookbook medicine” (meaning medicine that prescribes a general intervention for every patient facing the same ailment) and the problem of bias (or assumption of lack of bias) in randomized control trials, the hierarchies of evidence, scientific inadequacy, and unreliability; translational medicine that involves the translation of basic biomedical research to application to patients; and medical humanities exploration in the form of narrative medicine for exploring professional empathy and the phenomenological aspect of the relation between physicians and their patients. The methodology she spends the most time exploring is that of the consensus conferences followed by that of evidence medicine, with only single chapters, each, dedicated to translational and narrative medicine. Her reason is that medical consensus conferences are under-considered. However, the details she provides are useful for presenting the mechanics underlying a movement as heavy in the politics as it is in juggling multiple epistemic commitments and priorities, and which, to my mind, contains narratives that should be of interest even to those in the medical humanities. Solomon claims that there has not been much interest by historians and sociologists of medicine to investigate this area, which is puzzling, given that the question of authority and expertise, together with the political history involved in the development of the conference consensus program globally, should be of interest to them. Solomon limits her case studies to the development of the program and movement in the UK, North America (particularly the US), and Scandinavia Europe, although every country that practices modern medicine obviously will have their own form of consensus conferences; therefore the philosophical generalizations that are derived from the study of these cases could be apply, with some caveats and modifications, to other local settings. The case studies that inform her story provide a case of binary tensions that she does not want embodied by her analyses of the situations, but which she acknowledges to be an unavoidable consequence of competing epistemic and social priorities involved in generating consensus, in addition to meeting the expectations of the medical community and non-medical stakeholders that include administrators, policy-makers, insurance companies (or whoever that pays the medical bills), technologists, and perhaps even some members of the public (which include patient advocates and patients). Each of these stakeholders will have their own opinion over what is considered epistemically authoritative, credible, and objective, even if the point of consensus seeking is to break away from over reliance on arbitrary designation of authority. Using the example of the US-based NIH Consensus Development Conferences, she argues that the justification for the conferences is the production of credibility in translating research findings to the general health care providers and members of the public. Solomon considers knowledge dissemination and changing how practices of the medical professionals transmit trust as much as it does results, such as trust in the researchers, the review processes, and incentives that will change practices for the better. The rhetoric of consensus, according to Solomon, aims to dissuade other interested groups from manufacturing doubt on decisions made through the generation of authoritative sources of knowledge. However, the NIH Consensus Development Conference Program has since been retired, and evidence-based medicine apparently had taken over, although Solomon regrets that this potentially leads to the over-reliance of evidence-based medicine methods of more formalized knowledge assessment techniques rather than group knowledge assessment, which means giving evidence-based medicine a dominant position. At the same time, she acknowledges that there is a blackbox to the process of achieving consensus to hide the more ‘doubtful’ practices from public view, thereby maintaining a credible appearance. However, the Institute of Medicine (IOM) runs a modified version of the NIH program, which it claims will produce an “arguably” attainable and useful form of objectivity by not trying to eliminate intellectual bias, but rather, seeks for balance of expertise. She also cites other US bodies, which are variations to the NIH model, such as the Medicare Coverage Advisory Committee (MedCAC) and the US Preventive Services Task Force (USPSTF). The difference with the USPSTF model is that attention is also given to interface (socio-economic level) consensus to get as many different organizations and experts as they are able, to commit. She gives as a counter to the NIH consensus program, the ‘Danish model’ that takes on a public deliberative approach compared to the group expert judgment of the NIH model. She also looks at countries where health care is universal and centralized, such as in Canada and Europe; the differences in the system also change how the consensus conferences operate in these countries. The Canadian Task Force for Preventive Health Care has a permanent panel, rather than different panels for different topics, mainly because the evaluation is centered on primary care rather than the NIH model of evaluating specialty care. The European consensus model focuses more on developing interface rather than technical consensus, therefore focusing more on the social, ethical, and financial consequences of reaching a medical decision, even though they also preserve certain features of the NIH model such as a neutral (rather than ‘balances of biases’) panel, half-day of expert presentation and questions, with the production of a public statement the following day. Solomon points to the difficulties of producing mutually agree-upon guidelines, since different panels could arrive upon different guidelines within the same country and with regard to the same medical technology; moreover, the expert composition of the panel (whether they be disciplinarily homogenous or interdisciplinary) skews support for forms of interventions and therefore, the guidelines for the interventions. Solomon follows through this controversy with a more detailed philosophical discussion in chapter four, on the topic of consensus practices, including the difference between achieving consensus in science and medicine. As far as Solomon is concerned, consensus in science is merely aimed at achieving a semblance of united front on an issue that members of the scientific community agree on even if they might have different reasoning and interpretive processes for arriving at the same conclusion, such as in the case of climate change and their representation at the Intergovernmental Panel on Climate Change; consensus negotiation should not be utilized for negating controversy from developing due to conflicting views. However, I am not persuaded by Solomon’s claim that the Strong Programme, as advanced by the Edinburgh Science Studies unit, subscribes to a simplistic acceptance of negotiation to get to truths; if one were to read chapter seven of David Bloor’s Knowledge and Social Imagery, the argument appears to be that what is being negotiated is not the syllogistic rule of formal reasoning, but rather the application of that syllogistic rule; the negotiation takes place when the informal process of reasoning is applied to problematic cases that do not fit the mold at content level, even if the logical form appears to prevail. Bloor uses examples in mathematics, particularly arithmetic, to demonstrate his arguments. Therefore, the form of scientific (or mathematical) consensus Solomon attributes to the Strong Programme is not so much a case of scientific consensus in the literal sense of attaining agreement through discussions, but rather, to find ways for explaining seemingly illogical contradictions. Solomon ventures into discussions concerning different philosophical views surrounding group judgment, such as the usual assumptions regarding how group deliberations could be sufficiently robust and rigorous to withstand individual bias and error while including different points of views through relevant data and considerations. Group deliberation is seen as a way for uncovering presuppositions, and transmitting further evidence from some members of the group to the rest of the group, from the perspectives of internalist and externalist views. The core belief of internalist approach is that justification of belief is internal to each individual owner and available for reflection whereas the externalist approach allows one to have knowledge without being able to explain how one is justified or in possession of that knowledge. Her core thesis in this chapter concerns the potential for group think as a fallible point during group deliberation, on the premise that cognitive and motivational bias will always be present regardless of attempts at eliminating them. The problem of group-think persists due to factors such as the tyranny of majority (that led to the ignoring of dissenting views) and omission of relevant information. However the manner group think operates, Solomon is right in suggesting that factors such as peer pressure, pressure from authorities, pressure to reach consensus, time pressure, and obviously, the presence of particularly domineering members of the group (who are also the more privileged members of the group) can skew how decision-making is made, given that the fallibility of the parts (individual members) that constitute the whole (group) would hold under such conditions. Moreover, the desire for standardization through consensus also brings on the problem of the loss of autonomy for individual professionals who may not even have a say in the process. Even if the consensus method is not eschewed, Solomon suggests that the process involved is still work in progress for which no final judgment could be attained. Evidence-based medicine has much more literature that contributes to an exploration of its discourse, especially as it is a continuation of the empirical medicine discourse, such as in the context of clinical application. When different trials of the same intervention produce different results, an overall evidence assessment is made through the consensus conferences. Without rehearsing the evaluation of the practice of evidence-based medicine that Solomon provides, I venture that her most interesting contribution to the discourse is in taking out the usual assignment of mechanistic evidence (stemming from mechanistic reasoning), which she discusses in detail in chapter five, from within the evidence hierarchy because high-quality mechanistic reasoning is deemed to be logical and deductive (though she does not quite say why other than that mechanistic reasoning presupposes that one has complete knowledge for enabling that form of reasoning) rather than mechanistic reasoning. However, even if complete knowledge is available, it does not presupposes that the intervention proposed for applying knowledge of that mechanism will work; hence, mechanistic reasoning provides weak evidence while remaining useful as an instrument of discovery. Solomon uses the case of cystic fibrosis to illuminate her argument concerning application of mechanistic/causal knowledge and experimental heuristics come together. She argues that the case of treatment for cystic fibrosis is an example of evidence-base medicine through the deployment of a multidisciplinary medical team, with therapies that are discovered at distal or proximate ends of a causal chain such as in the case of the CFTR (cystic fibrosis transmembrane conductance regulator) gene; she claims that a treatment might not have been created specifically to address cystic fibrosis but rather conditions similar to the problem; nevertheless, regardless of the original intention of the treatments, they could still be put to test to see which are effective for dealing with cystic fibrosis. However, even with evidence of effectiveness (by the standards of evidence-based medicine), the question of why certain therapies work while others do not is not answered. The trials deployed are a mix of randomized double-masked, observational, as well as other methods. In addition, even the identification of genetic mechanisms underlying cystic fibrosis are successful in the early stages of genetic testing, the improved information produces more uncertainty because more variables are now at play. Although she acknowledges a more complex consideration is needed, I would suggest that the nested problem of mechanisms could be laid out through a cybernetic systems approach, a system which has been deployed in other forms of psycho-social therapies, such as family therapy and counseling. Chapter six sees Solomon returning to the problem of biases and of confounding factors (being factors that affect experimental and control groups in a sufficiently major way as to skew results); I agree with her argument that the hierarchy of absences of biases does not translate into a corresponding hierarchy pertaining to the reliability of evidence because any presence or potential for bias indicates a possibility for errors. Moreover, even a double-masked randomized controlled trial could fall apart when large differences are being measured, since this allow trial subjects to guess which intervention arm they have been assigned to. Solomon argues that external validity could serve as a check to ameliorating the problem of bias and weak evidence even in double-masked randomized trials through the deployment of background knowledge and judgment based on context of those targeted for intervention and the ensuring of common traits between trial participants and the rest of the larger population. Further, there is difficulty in generalizing the findings from trials due to biological and cultural variations and complexities (which inform much of the discourse in the anthropology of medicine). In addition, the trial may be designed to demonstrate a particular effect, and therefore, is controlled to the point of excluding the possibility for illuminating another important, even if seemingly irrelevant, condition. An important point for Solomon is that evidence-based medicine does not constitute an algorithmic or infallible scientific methodology; and her recommendation for dealing with this epistemic fallibility is to apply social interventions such as the setting up of trial registries with the aim of preventing manipulation of data, publication bias, bias resulting from time to publication, and conflict of interest, among issues that could potentially arise. Translational medicine, considered as a translation of pure science knowledge into effective healthcare application Solomon divides into T1, “applied research from bench to bedside (and back)” and T2 “moving successful new therapies from research to clinical context” (159), contains many historical cases that demonstrated the messiness, the timely arrival of a technology that could facilitated the operationalization of basic research after years of being stymied, and of course, the right team of people that all come together in the transformation from the lab bench up to the clinical stages. Due to some affinity and overlaps that one can find between evidence-based medicine and translational medicine, with evidence-based medicine requires a complementing methodology that could take on the risk, through the process of problem solving, careful observation, and tinkering needed to move the implementation of clinical intervention into the next level, even with success not assured and failure a strong possibility. For Solomon, translation medicine is that level before evidence-based medicine as it occupies the place in the context of discovery, while the more prestigious evidence-based medicine is located within the context of justification. However, given the underdevelopment of translational medicine at this point, Solomon has not too much to suggest from a philosophical viewpoint. However, she offers possibilities for how the methodology of translational medicine could be strengthened within the causal chain of various therapies to be applied, such as in the case of the CFTR gene. Her most interesting contribution in this regard would be to show how that is put to practice in her chapter on the pluralism of methods in chapter nine. In her appraisal of narrative medicine in chapter eight, Solomon does not offer as much philosophical insight into the contents of the narrative. Instead, she focuses her evaluation to the causality and effects of the deployment of narrative medicine, which provides a useful reflection on the intent behind the deployment of narrative medicine in the first place: forms of listening that need not be confined to the verbal, the creation of empathy at the experiential level (through an invocation of the aforementioned phenomenological method of eliciting the full spectrum of patient experiences), making the right diagnosis (through a close-reading of the narrative between the physicians and their patient), and making meaning out of the information compiled from the three aforementioned techniques. She also brings up historical precedents to narrative medicine that had other fallibilities, such as biopsychosocial model considered as lacking in intimacy, empathy, democracy, and attention to the dyadic relation between individual physicians and their patients; while deconstructing certain assumptions regarding the efficacy of narrative medicine in entering zones untouched by the biomedical-scientific method. Obviously, the philosophical insight that comes out of this investigation could go even further when paired with the technique of narrative deconstruction found in literary and other areas of inquiry attending more to the problem of narrative contexts and non-evident subjectivities. Philosophy may identify such possibilities, but its current deployment through philosophy of science and medicine lacks the capacity for deeper penetration. Philosophically, it would appear that narrative medicine has only a limited role to play in medicine by being confined to deployment in primary care and psychiatry; but cultural angle, there is much more that could be offered even to specialized medicine. What I find most compelling about the book is its advocacy of pluralism that is not merely a composition of multidisciplinary or multi-modal methodologies, but for how they could be integrated most effectively. Such pluralistic considerations have not have been given as much attention in the literature of medical humanities, or social-cultural studies of medicine. This book, perhaps, could open up more possibilities for such developments, especially for the examination of the development of medical infrastructures and practices outside of the Western world. The penultimate chapter takes a philosophical reconsideration of how certain traits deem crucial in the practice of science might work in reverse in medicine, such as that of dissent. However, I argue that the avoidance of dissent in medical practice will produce its own form of dogmatism, such as when less orthodox approaches of a yet unknown value are put forward, which happens more frequently than acknowledged. While I believe that the arguments she offers are important considerations for medical practitioners and not only to philosophers, the density of the material and the lack of clear prescription to practice would require patience from the practitioner-reader in their contemplation of how they could best profit from the discussions in the book. Bloor, David. Knowledge and Social Imagery: Second. Chicago & London: Chicago University Press, 1991. Solomon, Miriam. Making Medical Knowledge. Oxford: Oxford University Press, 2015.